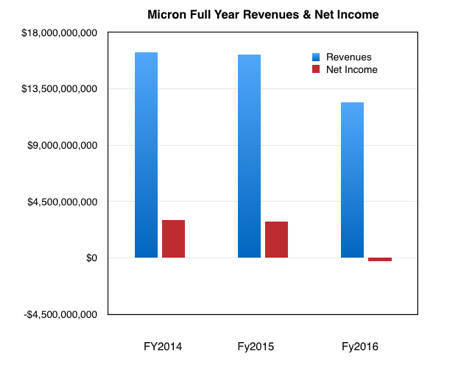 Micron has reversed its downward trend and pulled off a fourth fiscal 2016 quarter with increased revenues and decreased losses. The mainly DRAM and flash foundry company reported revenues of $3.22bn, up 11 per cent on the preceding quarter but 11 per cent down on the year; there is still a ways to go. The net loss was $170m, 21 per cent better than the $215m net loss in the third quarter but still dismal compared to the $471m profit reported a year ago. Since recovery came late in the year, the full fiscal 2016 numbers look poor: $12.4bn revenues and a $276m net loss. Last year’s numbers were $16.2bn revenues and a $2.9bn profit. NAND average selling prices were relatively flat. Micron is starting a 1X DRAM chip production ramp with significant output by mid-2017. It’s building up gen 1 3D NAND production and TLC (3bits/cell) product, and starting second generation 3D NAND production. This has a 30 per cent lower cost than gen 1 3D NAND. In the future lie QuantX 3D XPoint products, which will be a 2017 story for Micron, and potential QLC (4bits/cell) NAND. Toshiba should have QLC product in 2017.